Captain Tours and Travels Co. has been operating over a last 5 years in Holiday Package and was certified by IATA by 2010. 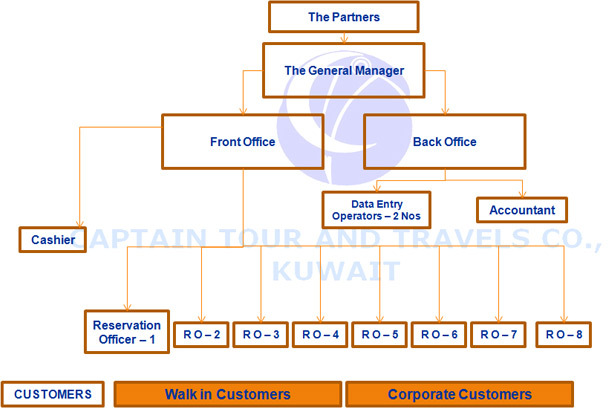 On the retail side, the Captain Tours and Travels Co. staff numbers 14 (combined companies employee count is 18). Though consistently ranked among the nation's top 15 travel management companies because of its size and the volume of business it , Captain Tours and Travels Co.has the feel of a small company that places a premium on high-touch customer service delivered by an exceptionally qualified staff which exceeds industry averages for years of experience and agency tenure. Over the years, Captain Tours and Travels Co. has also earned a reputation for innovative ideas and forward thinking. This mentality, combined with a hands-on approach to customer service, has earned us loyal following of clients who attest to our superior service capabilities. Captain Tours and Travels Co. currently serves the business travel needs of some 15 corporate accounts. They represent commercial and educational interests and range from 1-2 person firms to medium-sized companies with a high annual travel volumes. Captain Tours and Travels Co. embraces a business philosophy emphasizing the importance of honor, integrity and individual character. Staff members are passionate advocates for service to the community while at the same time seeking creative ways to make international connections that contribute significantly to a positive quality of life and a sound business environment for all. Captain Tours and Travels Co is associated with IATA and using Major GDS like Galileo, Amadeus, & Sabre wholesaler of international airline tickets to retail travel agencies nationwide. Serve the major Indian population in Kuwait with a high satisfaction in travel needs. Bring a high growth, innovative service in travel function with the international standard to Kuwait – Indian nationality and others. Serve the Indian society living in Kuwait, with a cheaper and best options of travel facility. Serve all other nationalities living in Kuwait by providing optimum travel solution. Provide travel supporting service like visa arrangement, hotel booking and other supplementary services. The Company currently serves the business travel needs of some 15 corporate accounts. They represent commercial and educational interests and range from 1-2 person firms to medium-sized companies with a high annual travel volumes. The Company embraces a business philosophy emphasizing the importance of honor, integrity and individual character. Staff members are passionate advocates for service to the community while at the same time seeking creative ways to make international connections that contribute significantly to a positive quality of life and a sound business environment for all. Copyright © 2013 Captain Tours & Travels. All Rights Reserved.